We are very taken by the quality of our three-year-old team this year and we take two of our better ones - Tivaci and Wichita Woman - to Saturday's Caulfield Cup meeting. Whilst she is still a maiden we are looking forward to seeing how Wichita Woman measures up in the Gr.3 Ethereal Stakes with Michael Moroney confident that the daughter of High Chaparral will relish the step up to 2000m. A fast finisher into the placings at her first two starts over shorter trips, Wichita Woman has drawn a bit awkwardly out in 13 on Saturday but again has the services of Craig Newitt. 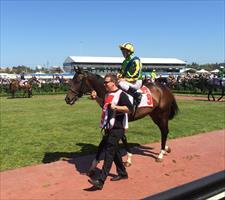 "It is a good field but she is a really nice staying filly in the making," Moroney enthused. "She showed good improvement between her first and second runs and has been going in the right direction since." This run determines whether Wichita Woman, whose dam is by the great staying influence Zabeel, heads to the paddock or stays in work for a crack at the VRC Oaks. Also stepping up to 2000m for the first time, Tivaci (pictured) takes his place in the Gr.3 Caulfield Classic with Damien Oliver aboard. To jump from the inside gate, the High Chaparral colt has improved at each outing and has also come on nicely at track work. "The penny is still to drop with him but when it does he is going to be a very good horse," said Moroney. "He just needs a bit of luck from barrier one and he can finish right in the thick of things." Another nice three-year-old in Loyalty Man heads to a Bendigo maiden on Saturday and he looks nicely placed to break through. Not far behind the placegetters in the Stutt Stakes at his most recent outing, the Fastnet Rock gelding has drawn out wide but will take his place with the stable keen to get his maiden out of the way so he can progress to better things. "He looks pretty hard to beat in this field," Moroney said, "and all going well he can go from here to the Carbine Club Stakes on Derby Day." The feature on Sunday is the Seymour Cup and we have Garud taking his place in the 1600m Listed event. Nicely drawn in barrier three for Craig Newitt, the consistent eight-year-old has been kept fresh since an encouraging first up third at Flemington in mid-September. "He looked like being a stayer when he was younger but these days he seems to be at his best from a mile to 2000m," Moroney said. "And he runs his best races fresh. From that good gate he looks to be one of the main chances." Earlier in the day we have Jackpot second up over 1200m with Steven Arnold riding. "He was a bit disappointing first up," Moroney conceded, "but his work has improved since. He is drawn to get the right run (barrier five) and he looks hard to toss."